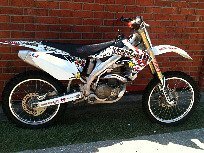 The 2005 Honda CRF450r for sale in this classified has brand new intermediate compound DUNLOP motorcycle tires, fresh oil and filter,Rockstar Energy graphics with all white plastics, a K&N air filter and pro taper handlebars. The Honda dirt bike for sale is in immaculate condition and keep reading because you will not come across a better deal. The motorcycle is located in Lewis full Texas and I am willing to part with this beauty that rolls and jumps like a beast for the very cheap price of only $2000. Now you see exactly why I say that you won't come across a better deal! The new owner will not receive a title but a bill of sale. If you have questions you can reach me by leaving your email me your questions and offers using the space below provided by Strike Lightning Used Honda Motorcycles for Sale (and PLEASE include your contact information!) and I will respond with answers to your questions or after consideration of your best offer as quickly as possible. Strike Lightning would also encourage bikers to submit a review of the 2005 Honda CRF450r for sale to make the dirt bike riding community aware of any problems that are common to the 2005 CRF450r to highlight its positive features and help potential buyers make informed decisions. A mention was made in the classified of a phone number but I don't see it. Could the owner of this dirt bike please post a contact phone number.